Economical and easy to install covers for IBC’s. Ideally used in conjunction with IBC spill sumps. Perfect for keeping rainwater out of spill sump. 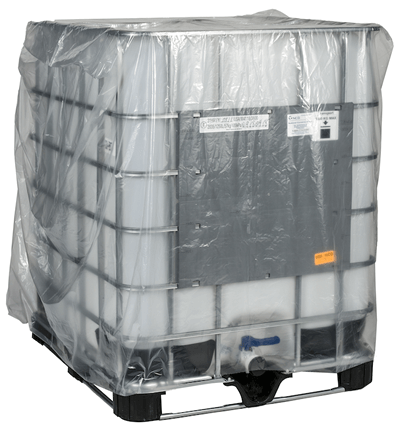 Tarp designed to fit most IBC and standard Containment Type Products. 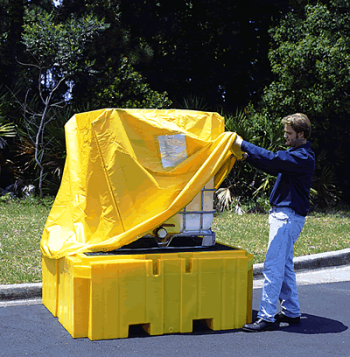 This tarp helps prevent contamination of drums and sump area, permit easy visual inspection, and keeps rainwater and debris out when stored outdoors. Elasticized bottom with adjustable straps. Attached document pouch for holding chemical information, MSDS sheets and other documents. 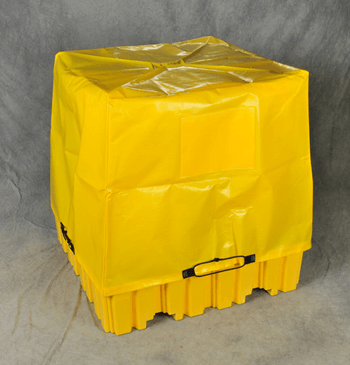 Dimensions: 56.5″L x 56.5″W x 44″ H.
Often referred to as dust covers, these Lighter Weight IBC Pullover Covers serve to protect IBC’s from industrial debris, dust, occasional splashes and other contamination. Multiple options, plus custom are available to meet most requirements. Be sure to check if cover has UV Inhibitors for outdoor use. Note: When shown in details, UV Inhibitors are often rated by percentage to provide a good idea of how long a cover could last outdoors. IF UVI not shown, outdoor usage is not recommended. 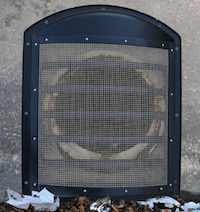 On custom covers with UV Inhibitors there are often minimum purchase quantities for non-stock types. Best practices are recommended to ensure covers are compatible with chemicals in the plant. Do you need a light weight clear full size cover, an IBC heater or blanket and any number of other options for covering your IBC. Call or email us with your specific requirement. We most likely have what you are looking for.